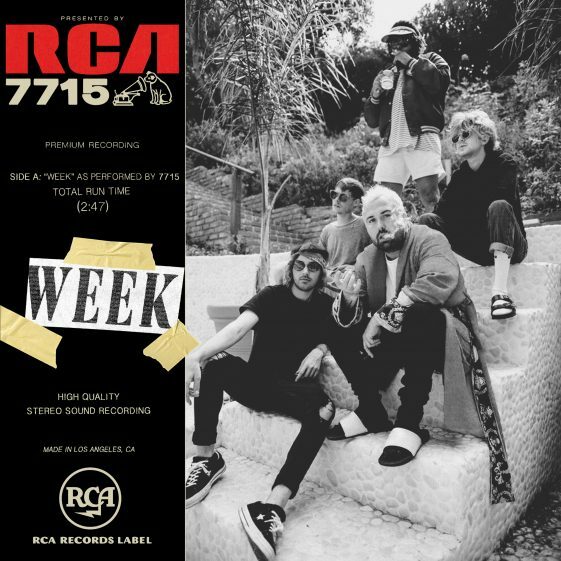 (November 9, 2018) – Alternative pop band 7715 announces their signing to RCA Records. In celebration of the release, the group releases their debut single and viral video, “Week” (click here to watch). The Jussifer (Kelly Clarkson, Bebe Rexha) produced track is the first taste of the group’s signature 90s alternative sound. 7715 consists of Stu Da Boi, Tyler Wilson, JP Clark, Dan Geraghty and JRM. Though the specific details may be a little foggy now, the story of 7715 Bluebell Avenue in Southern California comprises parties to rival Project X and The Hangover, magical impromptu late-night jam sessions, and the start of an eternal, the four lifelong musicians penned a song together in order to help Stu get over a breakup during January 2018. The intersection of three voices—namely Stu, JP, and Tyler—proved undeniable when backed by Dan’s production and instrumentation. Throughout 2018, the boys wrote and recorded. They welcomed an old buddy JRM into the fold and perfected a signature sound along the way.